Preschems products Polesaver rods and Bioguard Bandages are a solid form of slow release diffusible fungicide/insecticide wood preservative. Both products contain boron and fluoride as the active ingredients, the concentration of which is more than sufficient to stop decay (as centre rot) and termite attack in the heartwood of standing poles. Wood inhabiting fungi are responsible for the breakdown of timber through decay. An infection is introduced into wood by fungal spores, which are very similar to those contained in a mushroom. As decay becomes established and grows it advances in a front via root like tenticles called mycelium, the decay fungi initially establishes a chemical change through the excretion of enzymes and acids. These enzymes break down the chemical structure of the wood into simple sugars, which are used by the fungi as a food source. Over a period of time the wood will lose it’s strength and finally fully decompose. Decomposition of wood by fungi is of three main types, which are called brown rots, white rots and soft rots. Brown rot fungi utilize cellulose and the related constituents of the cell wall and leave lignin in a more or less unchanged condition. Because the “stiffening agent” lignin is left virtually untouched the form of the original cell wall is preserved, however the wood structure will easily snap or crumble away as cells tear apart. In it’s early stages wood can often appear better than it really is, and this is made more of an issue due to the fact that brown rot is usually found internally within the wood. Weight loss can be up to 65% and the decay can spread rapidly so that it can still be occurring in the original location while continuing to spread. White rot fungi concentrates its attack on the lignin within the cell and has the affect of breaking down the components of the wood. White rot usually leaves the wood fibres with a stringy appearance and white in colour. White rot can either attack large section or be contained within smaller pockets. The boundaries of white rot are more obvious and visible than brown rot. Soft rot fungi like brown rot fungi tends to attack the cellulose of the cell. Wood affected by soft rot may change to a slightly darker colour but often remains very similar in colour. 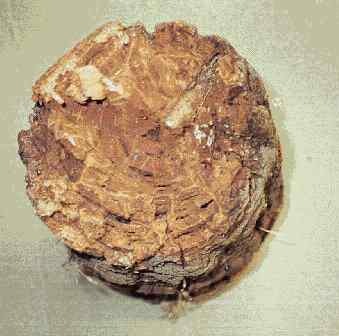 Soft rot normally becomes established in the exposed superficial layers of the sapwood (includes treated sapwood) and extends inwards with time. In the advanced stage, wood affected by soft rot is very soft and when probed breaks away in carrot like fractures. When dry the wood is more brittle and develops shrinkage cracks. In contrast to other types of decay, the rate of deterioration by soft rot is directly correlated with the amount of nitrogen and therefore it is more active in wood which is in contact with the soil or with water containing nutrients in solution. There are a range of decay stages, initially the strength and fibre characteristics remain unaffected, but in the advanced stages wood will loose texture and all strength. While external decay can be easily detected by probing internal decay usually requires drilling and evaluation of shavings. Drilling techniques are now often incorporated into inspection standards although the location of these holes is carefully specified so as not to unnecessarily weaken the pole. Some species of wood have proven to be quite difficult to assess (e.g. white stringybark) where the indicators for early decay are inconsistent and tricky to properly identify. At this stage the accepted practice for determining the integrity of internal heartwood is to use a drilling method where shavings can be inspected. It is important to recognize that the introduction of a drill to an area of wood already infected by fungi provides a means of cross infecting the fungi to another section of wood drilled by the same drill. It is common practice to either disinfect drill bits of sterilize each hole drilled for inspection purposes. Decay in wood is usually accompanied by a change in colour of the wood fibres. It is most important to remember that often a colour change is the very first sign of early decay stages referred to as “Incipient Decay”. The wood may become darkened by a brown rot or bleached by a white rot. Often the colour change may be subtle with either a light brown or yellow appearance in the case of brown rot or white flecks for white rot. The method used for fungus to reproduce is via fungal spores. Like a mushroom fungal spores are contained with a fruiting body which usually develops on the outside surface of wood. When fungus sprouts a fruiting body it is endeavoring to reproduce in a different location, which is a sign that one of the elements of survival is becoming depleted. A fruiting body may well mean the food source has been consumed which means the fungus has decayed the majority of the available wood. Often fruiting bodies on non-pressure treated poles or crossarms are taken as a positive indicator of major degradation and further action considered urgent. Sound wood has a solid splintery texture that will cause a drill bit to make a crunching sound. Decaying wood looses texture and results in shavings becoming crumbly and in extreme cases become compost like. This is accompanied with a lack of bite with the drill bit. This change in texture also reflects the change in density as the weight of the wood disappears with the destruction of the wood substance by the fungi. Wood affected to any appreciable extent by fungal decay may have a mushroomy or mouldy smell. The presence of such odours, although generally indicative of damp conditions, which favour the development of moulds, does not necessarily mean that there is actual decay present. However a clean fresh resinous smell is a good indication of sound wood. Some wood has their own individual smell that is often quite noticeable when boring. During the decay process the wood can become softened. This softer wood will not pull up in long splinters but rather break off in short pieces over the top of the tool. This brash characteristic results from the loss of strength and is very common in poles suffering from soft rot. The section of the pole affected by decay has a significant impact on the resulting strength loss. The outside section has by far the most contribution to the strength which is one of the reasons many poles have the sapwood layer pressure treated. As a rule, in excess of 50% of the strength of the pole is contained within the outside 10% of it’s diameter. This does not mean however that control of decay in the internal section is not important. Heartrot will usually grow to an extent where it will affect the high strength area and may even lead to fungal infection of the critical outer section.